The NEC is very specific about the loads permitted on branch circuits. Here is a recap of these requirements. 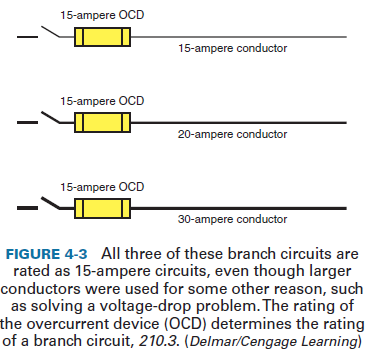 • The load shall not exceed the branch-circuit rating. • The branch circuit must be rated 15, 20, 30, 40, or 50 amperes when serving two or more outlets, NEC 210.3. • An individual branch circuit may supply any size load. a. may supply lighting, other equipment, or both types of loads. b. for cord-and-plug-connected equipment, shall not exceed 80% of the branch-circuit rating. c. for equipment fastened in place, shall not exceed 50% of the branch-circuit rating if the branch circuit also supplies lighting, other cord-and-plug-connected equipment, or both types of loads. • The 20-ampere small-appliance circuits in homes shall not supply other loads, NEC 210.11(C)(1). • 30-ampere branch circuits may supply equipment such as dryers, cooktops, water heaters, and so forth. 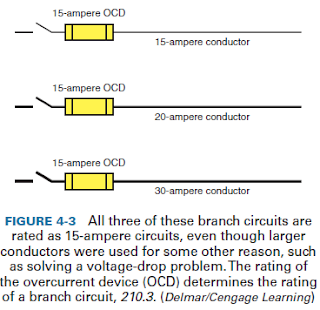 Cord-and-plug-connected equipment shall not exceed 80% of the branch-circuit rating. • 40- and 50-ampere branch circuits may supply cooking equipment that is fastened in place, such as an electric range, as well as HVAC equipment. • Over 50-ampere-rated branch circuits are for electric furnaces, large heat pumps, air-conditioning equipment, large double ovens, and similar large loads.